Always write for #1, but always keep #2 in mind. What I mean is that you should always write with the intention of strengthening your brand because that will always trump SEO. The side effect of this is that in the long run this also bolsters your SEO. When I say you still need to keep the search engine robots in mind when writing your posts, what I mean is that you need to help them out in showing how awesome your content is and who it was written for. Who it was written for? Yes, who it was written for. Whenever you write a post you should imagine you are speaking to one person. That one person has a question that they want you to answer. Is your post providing them with that answer? Of course, it is. Think about when you search for something on Google. Almost everything you search for is a question. It might not be in the form of a question, but it is still a question. If I search for butler in clue then what I really mean is Who is the Butler in the movie Clue, but there is no need for me to type all of that. Hopefully, the first response sends me to the exact answer I am looking for. It usually does because the search engines are getting pretty good at their jobs. This is why it’s important you ensure that the search engine robots know who the post is for. What question are you envisioning someone asking that will lead them to your post? So how do you let the search engine robots know who the post is for? Well keep reading and I’ll show you the 7 SEO basics that every blogger should know. When I first started blogging I thought I was pretty witty with the blog post titles that I was coming up with. Sure they were great (or maybe the weren’t), but the problem is nobody knew what the posts were about. If by some chance one of my posts appeared in Google would anyone want to click The Eye of the Donkey Is Invisible when searching for ways to burn fat? I’m not saying that your blog post titles have to be boring, but make sure they are clear. The blog post title should let a person know exactly what they are getting into. For example, the title of this post leaves you with no secrets. You aren’t guessing what this post is going to be about. You know there are 7 things I am going to talk about in it so you proceed to read it. Search engine robots know that this post is about SEO tips because it is right there in the title. You’ll have plenty of time to get cute and witty within your blog post. The title of your post isn’t the time. Choosing the right keywords is a topic that could span a whole book. The basics of it though are that you want to think about a phrase someone would search for. In the case of this post, it might be SEO tips. That would be the main keyword that I am targeting with this post. That means not only should it be in the post title, which it is, but it should appear in the content a couple of different times. The reason for this is because you want to ensure the search engine robots know that your post is relevant to a specific search. If I’m writing about fat loss again, I need to ensure that I’m mentioning that in my post. If the only mention of fat loss is in the post title then I probably won’t rank very well. Don’t go crazy putting the keywords in every single paragraph. Sprinkle them around a bit and be on your way, but do so in a way that seems natural to your post. If it comes down to forcing a 5th time to put fat loss in a post versus making sure my post is awesome, I’m going to go with awesome every single time. Remember that you are writing for people. The machines come second. If you aren’t sure how often your keyword appears in your post and you are using WordPress then I recommend you install the Yoast SEO plugin. It does an excellent job of checking on the basic SEO things that every blogger should keep in mind. One of those things just happens to be keyword density. Yoast SEO is really helpful with regards to checking keyword density. As you can see Yoast is telling me my keyword density is kind of low and it usually is in all of my posts due to the length of them. I’m okay with that because I want to make sure my writing works well for humans. It doesn’t make sense for me to continue to stuff in a keyword just for the sake of it. We can do a lot of cool things with computers today. We have self-driving cars and ways for rockets to land on ships without any help. Unfortunately, search engine robots don’t do very well reading images. Why should they? 99% of the stuff they consume is text and people with disabilities can’t view images in their screen readers. Images are great to have in your posts, but don’t use them to represent text content. Headings should just be headings, not fancy graphic banners. When you do use images, make sure you use the alt attribute. What is that? It’s an attribute in an image tag that shows up when a browser can’t render an image. Notice the alt="Obstacle.co Logo" in there? That’s the alt attribute in the image tag. This is a great place to put your keywords in because sometimes people like to use Image search when trying to find something. It really helps Google out if your alt tags are related to that search because then Google knows that the image will probably help their user. If you are using WordPress and adding your images through the Add Media button, they make it really easy to include the alt attribute in your image tags. When uploading an image you will be presented with this screen where you can type in the alt text. Once you’re done, WordPress will add the image code into your post which will also include the alt text. Pretty cool. How often do you go to a business and pay for their services without getting a recommendation from someone online or someone that you know personally? Probably not very often. That’s how search engines look at your site. They want to see how many people link to your site since they see it as sort of a recommendation. If a big player in your niche links to your site that is a big deal to the search engines. If you run a fitness blog and get linked by a personal finance blog then that is still kind of cool, but not as relevant. What I’m trying to tell you is don’t waste your time trying to get links from any site on the web. To the search engines, where those links come from matter a lot. Now you can’t control where you are getting linked from, but when you are actively trying to get backlinks, ensure that they are from sites in your niche. Backlinks (links back to your site from external sites) are not only good in sending traffic your way but also good in helping your search engine rankings. So how do you get these beautiful backlinks? You promote the hell out of your stuff. You’ve spent a ton of time writing something awesome so don’t hesitate to spend that same amount of time, or even more, letting other bloggers know about it. This could be done via social media, but don’t be scared of email either. It is more effective if you’ve mentioned the blogger in your article since that gives them a reason to check it out. Hey check this out because I think it is awesome probably isn’t going to work. And don’t be scared of rejection. Odds are most of the popular bloggers won’t respond to you because they have no idea who you are, but that shouldn’t stop you. Stick with it and eventually when they see your name in their inbox, they’ll be sure to open the email immediately. Imagine you built a house where none of the rooms are connected. To get to each room you had to walk outside and walk into another door. Seems pretty miserable, right? Well, that’s how some of you treat your site. The only links to other posts on your site are found in the navigation or sidebar. Search engines know about those links and don’t really pay much attention to them. They want to see the links in the actual content so if there is a nice time to link to an older article, do it. This should be almost every single time considering the fact you are sticking to a particular niche (hopefully). The hardest part that I’ve encountered is remembering everything that you’ve ever written. Don’t fall into the trap of thinking that once you’ve written something and did the initial promotion that you are done. Far from it. You should still be trying to send people to your older content all of the time, especially if it is evergreen content (content that never goes out of style). Internal links are a great way to do that. Not only does internal linking help with the search engines, but your readers will love it as well. There is nothing better than getting sent to more relevant information. Your intention should almost be to get your readers lost down a rabbit hole of your wonderful content. They start on one page and 27 hours later look up and realize they missed the Game of Thrones finale. It’s okay though because they learned a lot from you. 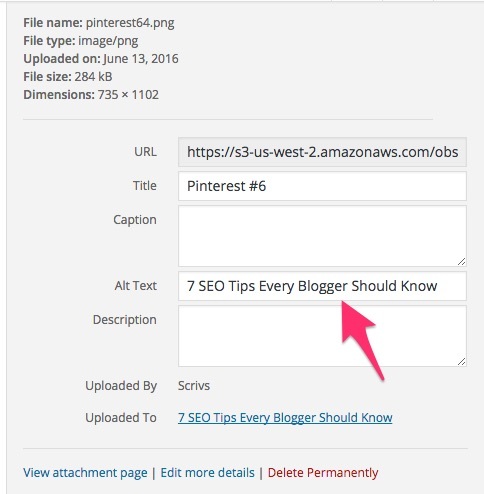 As you can see, the 7 SEO tips (keyword density plug!) are not that hard to follow when you are writing a post. If you keep them in mind, eventually you won’t even have to consciously think about them when writing. They will be as automatic as stealing someone else’s fries when you told them you didn’t want them. As I mentioned before, the Yoast SEO WordPress Plugin does a great job of acting as a reminder for some of these tips. However, don’t take everything it says as gospel. It should merely be used as guidance. You’ll drive yourself crazy if you try to get all green dots and odds are your content will appear more to the robots than to humans. You don’t get what you don’t ask for so I’m asking you to take a second to share 7 SEO Tips Every Blogger Should Know with your audience. They respect great content.